Phew! The last 5 days were a whirlwind of activity that concluded with the completion (well, almost) of the new Cedar Hill Park playground. Some finishing touches remain: hooking up a few more swings, installing the waves around the new pirate ship (you’ll have to see it to understand), hanging some plaques in the castle and the pirate ship, and putting a protective coat of polyurethane onto various decorated surfaces. 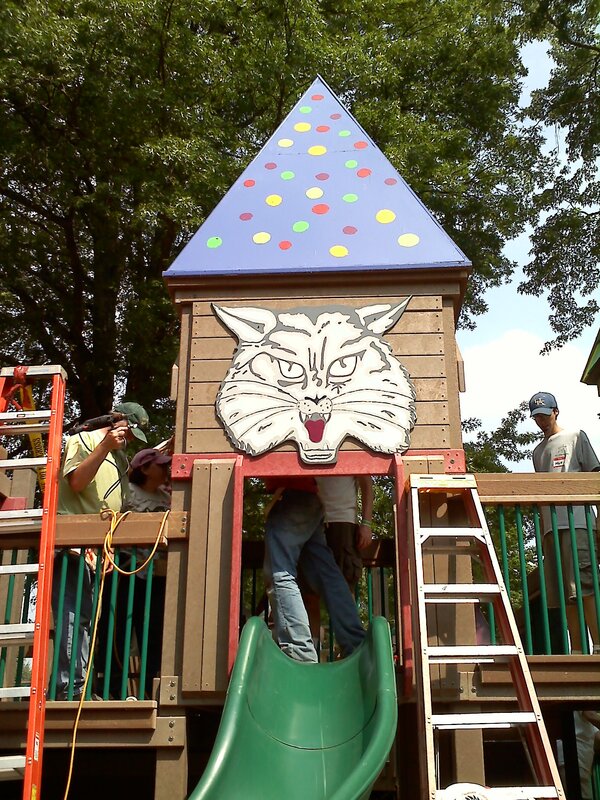 Jerry Creasey (Anderson County Commission member) designed the wildcat that hangs over one of the slides, but it took a village to paint it and install it on the last afternoon of the build. I was pleased to be able to make it out to the build site every day as a volunteer. I didn’t work on the 1988 build (I was the mother of an infant), but my family enjoyed the playground over the years, so I figured it was my turn to build for another generation. It turned out to be fun — not only were we converting a lot of very raw material into a fun place, but working together with other citizens was a great opportunity to reconnect with old acquaintances and get to know people I hadn’t met before. I worked on several bits and pieces of the playground — making slats for the suspension bridge, helping to make a “vertical ladder” (not to be confused with horizontal ladders), painting primer on several surfaces that were later decorated by more artistic folks, making plaques for kids to decorate (the plaques are being placed around the low perimeter wall), painting the train station and locomotive in the toddler area, plus a few other things. Teamwork — and good direction from the Leathers company — makes the various pieces come together. Oak Ridge loved the old Cedar Hill Park playground, but I predict that kids are going to tell us that the new one is even better. It wasn’t exactly crowded, but on Sunday afternoon Cedar Hill Park playground entertained several families visiting for the last time before it closed on Monday to be torn down and replaced. 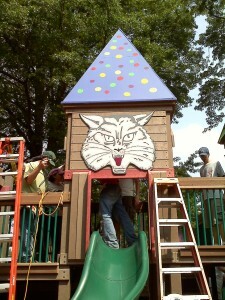 It’s been a wonderful play space since 1988. My family is one of many that have fond memories of good times there. However, it’s showing its age — much like the kids who helped design it and build it in the 1980s. 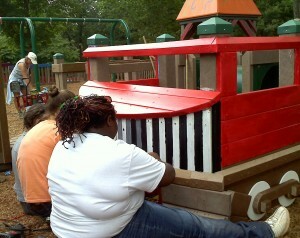 The wood is getting splintery and some of the play areas no longer meet current safety rules. That’s why it’s being replaced with a new similar “kid-designed” playground, once again to be built by community volunteers under the direction of Leathers & Associates. The new playground will be similar in design, but it will be built with recycled plastic lumber that should last about 50 years — and can be painted much more extensively than the pressure-treated wood used in the 1988 playground. The community build will happen Wednesday, May 18 through Sunday, May 22. Hundreds of volunteers are needed each day. There are volunteer jobs for just about everybody — from actual building to child care (so parents can help build) to serving food to the volunteers. I hear that the Leathers folks know how to find useful tasks that even young children in the child care area can feel they are part of the construction process. Sign-up is on this webpage. The 12-hour work day is divided into three shifts: 8 am to noon, noon to 5, and 5 to 8 pm, and volunteers can choose a job that suits their abilities and interest. I haven’t picked my jobs and times yet, but I know I will be there to help make a new playground that will be as great for tomorrow’s kids as this one was for my son and his friends. Tonight City Council has the wonderful opportunity of choosing 9 fine citizens to serve on the new Parks & Rec Board, but we also will have to “not choose” 51 equally fine applicants. I can’t vote for nearly everyone I have a high opinion of — so I’m thinking about how to harness some of the energy and enthusiasm demonstrated by the applicants we can’t appoint. I hope the board members will be people who are effective at getting things done and working as team members, open to new ideas, and respectful of other views — and I want them to represent a variety of experiences, recreation interests, stages in life, and neighborhoods. I’m acquainted with about half the applicants, including several who have amazing track records at making good things happen. I find myself evaluating applicants on minor things like whether their jobs demand a lot of out-of-town travel that would cause them to miss meetings. Dog park. This is a need identified by a number of residents — and a special interest that is unlikely to be a focus for most members of the parks board. Also, if a dog park is started, there will need to be a strong user community (of dog owners) to police it. Starting a task force that is related to the parks board, but separate from it, would be a good start towards creating that community of responsible users. Play. The organization KaBoom! 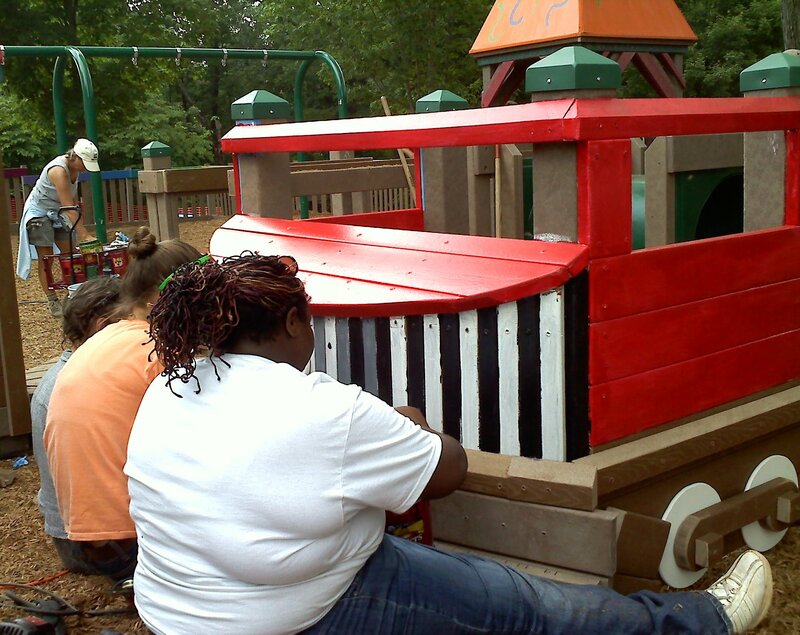 designates “Playful Cities USA” based on a city’s commitment to play (for kids, not dogs). This would be a nice designation for our city, and some of this think it could be attained at minimal cost. Starting a “Playful City” program is likely to require some intensive involvement from a core group, but for a relatively short period. That’s a good thing to assign to a task force that will report regularly to the full committee. Edgemoor Road corridor. Planning for integration of bike paths and other recreational facilities with the widened highway is another activity on city staff’s menu for this committee. This is another topic that is likely to require fairly intensive involvement for a defined period of time, making it a good thing to assign to a focused task force. Additionally, this is something that would be a strong fit for the experience, skills, and interests of some parks board applicants, but is unlikely to be of particular interest to the majority of applicants/appointees. Programming for seniors. This is not supposed to be part of the new board’s scope, but there are a few parks board applicants whose main/sole stated interest is the senior center and who may have some good things to offer — and opportunities may exist for improvements. This task force would involve an intersection with the Elder Citizens Advisory Board (ECAB) and would look at possible new activities for the senior center and opportunities for increased integration/coordination with other recreation programs inside and outside the city’s recreation and parks department. I believe there are opportunities for program enhancements at minimal cost, and some fresh thinking on senior programs could be very helpful in planning for future senior center facilities. City relationship with various local sports/recreation interest groups. Developing and revising policies and protocols is likely to be a long-term challenge for the parks board, but some early focused discussions and interactions could be beneficial. I am looking forward to hearing from people who have other good ideas — and I’m anticipating awesome contributions from this new board! Referendum on guns in city parks? Thursday’s Oak Ridge Observer reported that Alex Moseley is circulating a petition to force a referendum on the matter of whether handgun carry permit holders should be allowed to carry guns in Oak Ridge city parks. The strange thing about this news is that there is no provision in the city charter — and apparently not in state law, either — for citizens to petition for a referendum to override the City Council resolution to “opt out” of the state law that would otherwise allow permit holders to carry guns in parks. State law does allow citizens to petition for referendums over general obligation bond issues (that law was the basis for the Crestpointe referendum in 2007 and the referendum on the mall project several years before that) , but nothing allows for a referendum over any other type of City Council action (otherwise, we’d probably have referendums in Oak Ridge almost every month). Furthermore, the city attorney tells me that the General Assembly didn’t put any provision for a referendum in the state law that allows guns in parks. The charter does have a provision allowing for recall petitions against City Council members, and it was rumored that handgun advocates were going to try to recall those of us who voted to keep guns out of our parks. However, the newspaper article clearly indicates that Moseley isn’t pursuing a recall campaign. The article goes into great detail on the requirements that Moseley’s pettition would need to meet (2,610 signatures in 60 days) and how he expects to use the Memphis Commercial Appeal‘s database to identify the local handgun permit holders who are assumed to support the proposed referendum. Also, there’s an editorial suggesting that the referendum will teach City Council that we should follow “the will of the people”. What’s missing is any indication of the supposed legal basis for this petition drive and referendum. It’s hard to believe that Moseley, who was the Republican nominee for the Tennessee House of Representatives last year, is unaware of the law. Oh, and as long as assertions are being made about the “will of the people” regarding this measure, it should be noted that the great majority (well over 60%) of the many people who contacted me about the opt-out resolution favored opting out (that is they opposed allowing guns in our city parks). 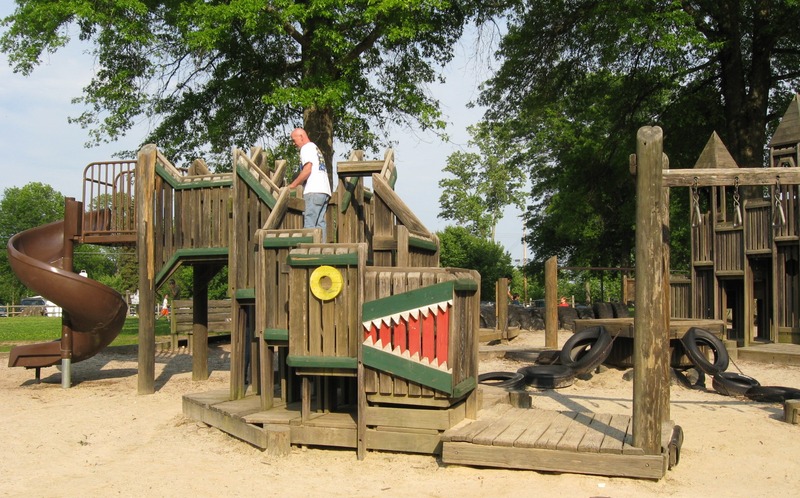 The morning news on WUOT included a report that the City of Knoxville is phasing out the popular Fort Kid playground near the World’s Fair site. It’s going to be replaced by a new playground on the Fair site, apparently one of the modern plastic and steel variety. Fortunately for fans of amazing wooden playgrounds designed by local kids, the Cedar Hill Park Playground in Oak Ridge is not going away. The Cedar Hill playground (built in 1987) was the first of these wooden playgrounds in the Knoxville metro area, designed and built by community volunteers with the advice of the Robert Leathers organization, and soon it may be the only one. The kids who designed the Cedar Hill playground as elementary school students are now well into adulthood, and last year the Recreation and Parks Department told the City Council budget committee that the playground is showing its age and needs continuing repairs, but it’s still open for the enjoyment of all. The playground photo is from Kris Light’s website. See more of her photos of Cedar Hill at EastTennesseeWildflowers.com.